When it comes to kiddos, NO is a universal language, is it not? 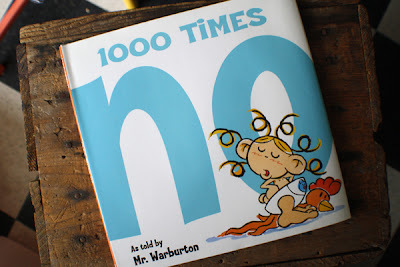 1000 Times No makes for a great read aloud. Mr. Warburton has delightfully illustrated a child in the throes of No! From your average obstinate negative declaration to your fancy-pants multi-lingual Nu-uh, this book will be sure to delight. Oooh and lookie, there is video on vimeo as well! I love the little video that always came on the tv. It reminded me so much of my grandson. Hehe!